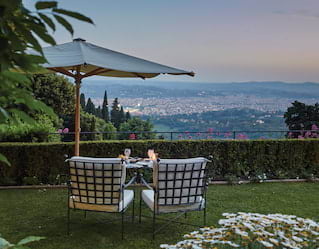 Celebrate above clustered Renaissance rooftops at Belmond Villa San Michele. Our idyllic hilltop setting, high-specification equipment and sensational cuisine make us one of the finest Florence venues for weddings, meetings and celebrations of all kinds. Get in touch, and our dedicated team of event planners will help create something spectacular. The light over the Arno Valley is captivating at any time of day. Seal your love beneath soft pink skies, overlooking the maze of Florentine streets below. Exchange vows beneath the shade of fragrant lemon trees in our sun-dappled gardens. Or marry within our 15th-century arched facade while a fiery amber sun sets outside. A wedding at Belmond Villa San Michele evokes a Renaissance-style romance that’s impossible to forget. Descend hand-in-hand into the patchwork of cobbled streets for a lively morning espresso. Sit back for a boat trip along the Arno River as the day draws on. Back at Belmond Villa San Michele, dine on local delicacies at La Loggia before curling up for starlit cocktails on your suite’s terrace. You’ll be wishing your Tuscan honeymoon could go on forever. Romantic vistas abound at every corner of this astonishing Renaissance villa, perched among lush Italian gardens. 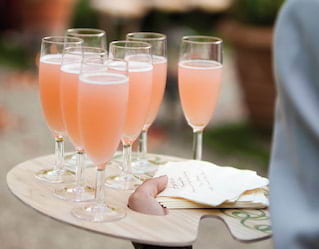 For the ultimate Tuscan treat, take over the whole hotel, and let our talented team finesse every aspect of your event. Amid ancient cloisters, fragrant rose bushes and trailing vines, the party of a lifetime awaits. There’s nothing quite like an idyllic Italian break to bring your team together and make them feel valued. 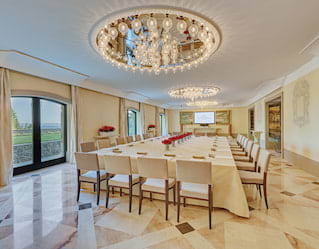 Host a meeting in a magical Renaissance room. Join forces for a rowing trip along the Arno River. Hone your culinary prowess and learn the secrets of Tuscan cuisine with a group masterclass. Or take to the skies for a hot-air balloon ride, and marvel at the intricate web that is Florence from above.